'EP Series :Herbs & Spices' is going to be a monthly event to know our herbs & spices better.There are a wide range of herbs & spices starting from the simplest ones to the rarely used ones.The theme herbs & spices is vast and we can't cover it in just a month event.So,I have chosen a herb & a spice to make it easier for a month.And there are many hidden recipes with these herbs & spices,so I just want to bring them together under one roof so that it becomes easier for us to browse these recipes.The recipe can be from any continent and usage of both herb & spice together in one recipe is also not required,either of the two can be used.But that should be one of the main ingredients strictly (not the ones used for garnish and tempering).All this is possible only by your support and interest,friends.I also take the privilege in inviting all my other fellow bloggers who are interested in guest hosting the event for a month with their own selected herb & spice for that month unless its already used or is already booked.Starting from tomorrow,1st March -31st March,am hosting the event at my Erivum Puliyum space,& you guys put on your unique aprons & send in your entries right away to share & learn better !! -The event runs for 1 full month starting from the 1st -last day of the month. -You can choose your interested herb & spice for the month,your own discretion,just make sure that you chose one herb & one spice for the month. 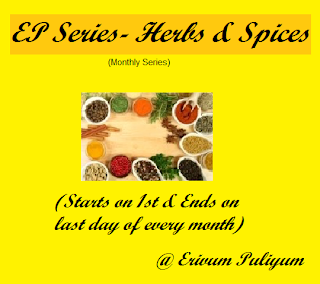 -Do drop me a line at julstreat(at)gmail(dot)com if you are interested to host for a month and specifying the herb & spice too so that we can know at the earliest & confirm the months. -The link to the round up of event should be sent to me so that I can publish it in the round up page calender at my space too,(The link is here). -The awards can be your given at your own discretion. 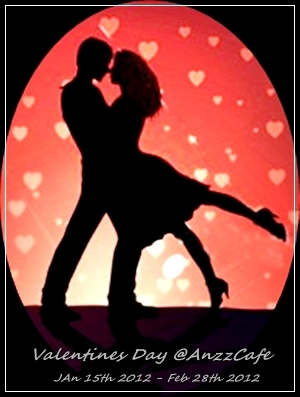 1.The event runs for the period of 1st March- 31st March 2012. 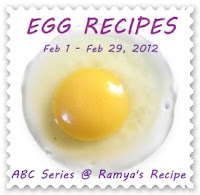 4.Recipe must be linked to this event announcement page and to the host's event announcement page if hosted by a guest. 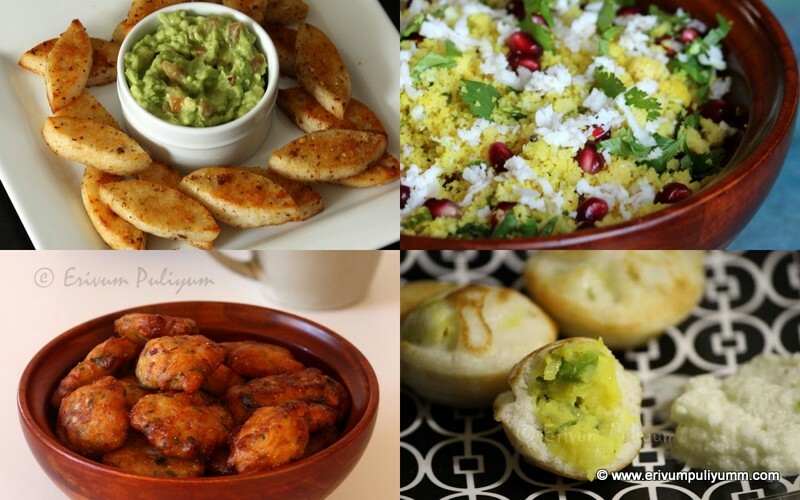 5.You can link both Veg & Non Veg recipes. 7.Usage of logo is appreciated for all entries. 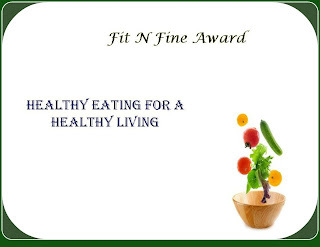 That is not the end to it; There are 4 awards for the BEST INNOVATIVE RECIPE AWARD, TOP CONTRIBUTOR AWARD,BEST HEALTHY DISH AWARD & PARTICIPATION AWARD.So,Folks put on your innovative caps and think tight,do right and link in your recipes at the earliest before 31st March,2012. Best Wishes to All !!!! * Either cumin or cilantro leaves can be used. or both can be used. 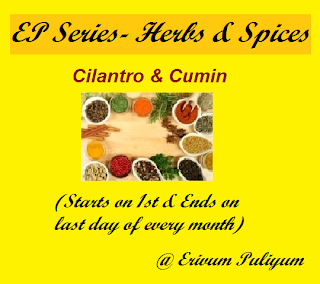 * Either cumin /cilantro leaves must be a compulsory and main ingredient.Cumin should be atleast 1tsp used in the recipe. 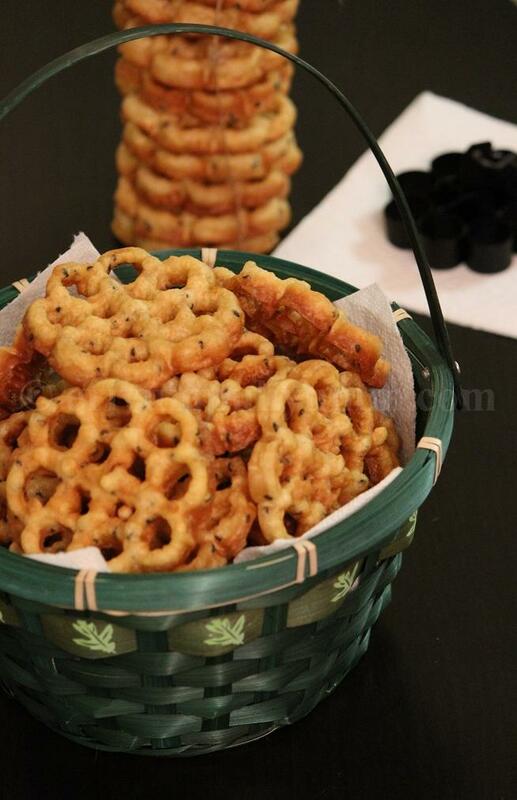 Corn Chaat (Sweet,Spicy & Tangy Combo) & Awards !!!! Sweet corn chat is a simple yet tasty recipe which can be done as a quick fix for kids in snacks.Though sweet corn consists of large amount of sugar in it,it has significant amount of anti oxidant properties which reduces the risk of heart diseases and cancer.This recipe can also be had as a healthy salad.We all love corn kernels so this is an easy alternative and I usually prepare it on a tired day when am not in a mood to cook anything!! Method -Steam the packet of corn in a microwave according to packet instructions. 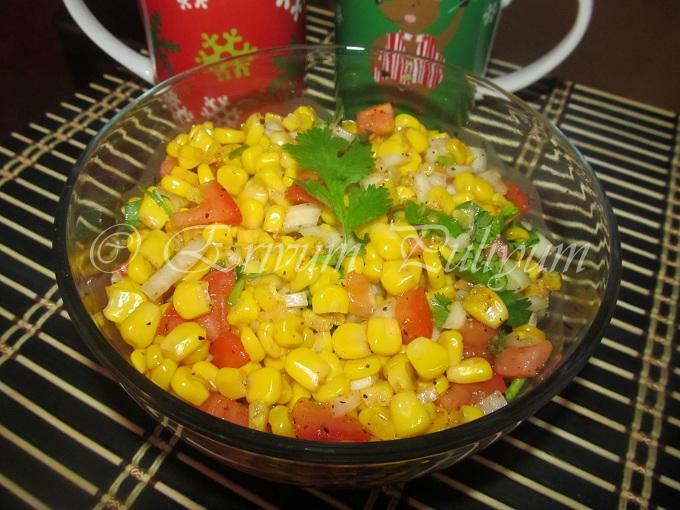 -If you are using fresh corn kernels,then steam the kernels in a steamer for 10-15 minutes. -Chop the veggies,And combine all the ingredients in a large bowl and toss. -Add in the salt,lemon juice,sweet chilli sauce,chat masala. -Toss and ready to serve!! * You can add only black pepper powder instead of sweet chilli sauce.But the sweet chilli sauce gives a unique flavor to the chat. 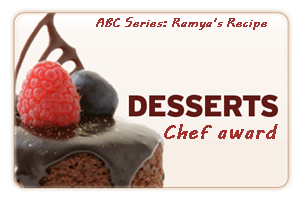 I am happy to participate in the ABC series- Desserts and have won the Dessert Chef Award.Thanx Ramya @ Ramya's Recipes for the lovely award and her ongoing series now is ABC Series-Egg Recipes,Do participate friends. Am happy to share that I recieved' Fit n Fine Award' for participating in the event Fast Food not Fat food guest hosted by Priya Sreeram @ Bon Appetit . Thank You,Priya!! 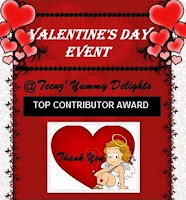 I received 2 awards from Valentines Day Event Participation award & Top Contributor Award for the Valentines Day Event hosted by Teena @ Yummy Delights. Thank You,Teena!! I also received an award from my dearest friends Simran @ Lazy Cooks Kitchen, Rasi @ Vegetarian Food & Me,Vimitha @ My Culinary Trial Room , Hema @ Aromatic Cooking & Divya @ Divya's Culinary Journey.Thanx a lot friends for the award,Feeling really honoured and very happy too..
1.Add the Versatile blogger award. 2.Thank The blogger who nominated you in a post with a link back to their blog. 3.Share 7 completely random pieces of information. 4.Include this set of rules. 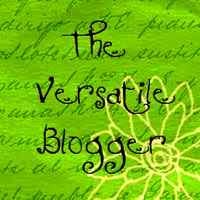 5.Forward this to 15 other bloggers and inform them with a comment on each of their blog. 3.I hate sitting idle; Am always with some work or the other..The person who gets annoyed the most is my dear hubby. 4.I have lot of other hobbies too like painting,embroidery work,knitting or beading.But after kids are born,it is just gone over to null and sometime find some time for beading. 5.I don't easily give up things,keep trying a lot..My husband says I got lot of patience. 6.I always love perfection & so am not satisfied with many of the works I do & find ways to improve upon.Also am particular to cleanliness, keep my rooms very clean & tidy.So sometimes even get angry at kids for not placing their toys in place. Copy & paste it your adorable space and add it to your accolades,Enjoy !!! Nutella is one spread which none will utter 'No'to the taste,Isn't It? We are a nutella family,everyone loves it so are the nutella recipes too..So blindly I can state that my family will love it!! 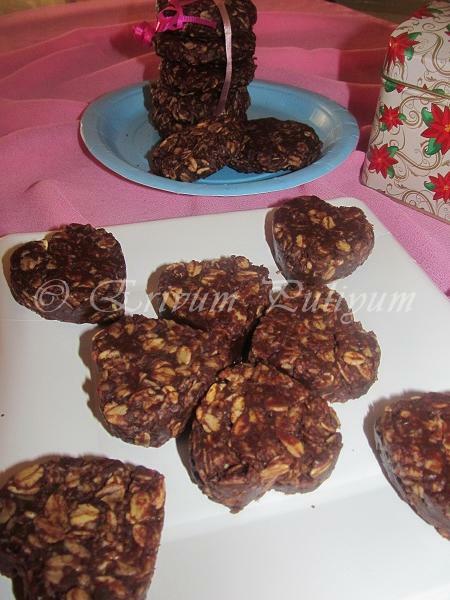 Earlier I had posted the Nutella Palmiers and now here comes another interesting recipe of cookies using nutella,these cookies are not baked and have oatmeal as the binder,they are chewy soft cookies and all will definitely love this.The ingredients are quite simple to remember ,all 1/2 cups except sugar and rolled oats.Do try these healthy cookies and serve as quick alternative for kids snacks or breakfast too!! -Heat a sauce pan on medium heat,combine the sugar,cocoa ,milk and butter .Bring to a boil stirring continously till there are no lumps.Simmer the heat and let it boil for another 3 minutes.Put off the flame. 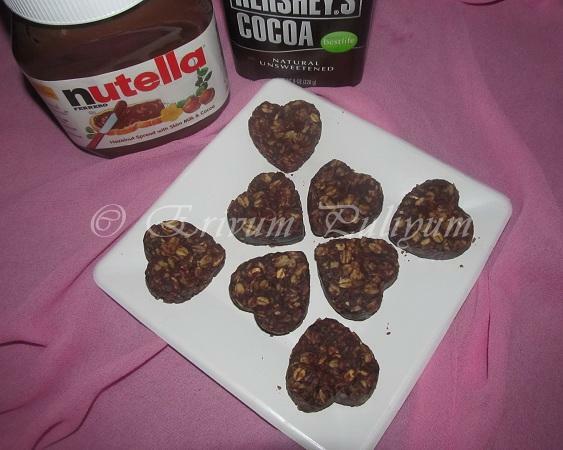 -Remove from heat ,add vanilla and nutella. -Add oats and mix well. -Drop quickly on a parchment paper when warm or shape it into desired cookies shape as they can be easily rolled in hand. 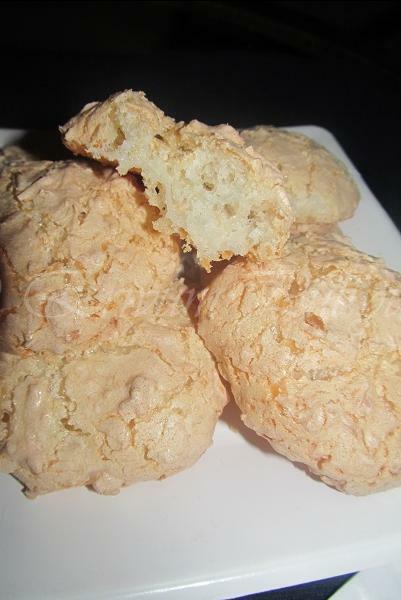 -Allow cookies to cool and set for 30 minutes. -Add in the granulated sugar and whisk again till its becomes silvery white and glossy. 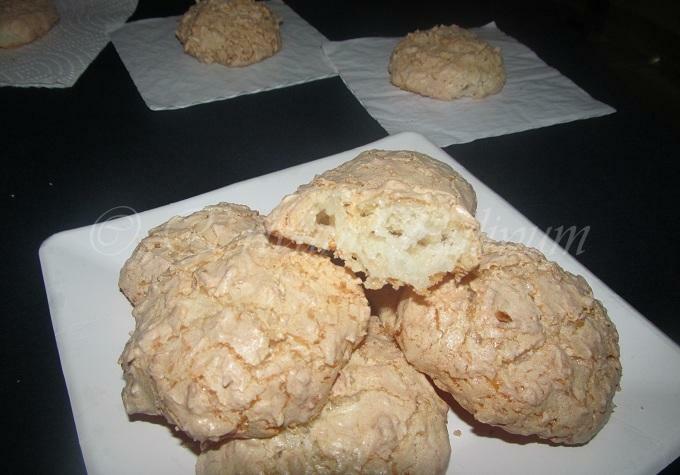 -Fold in the coconut flakes .Preheat the oven to 325 degrees F and line a tray with parchment paper. -Drop a spoonful of mix and slightly shape them into round with the back of the spoon .Leave a space of 2'' in between cookies. 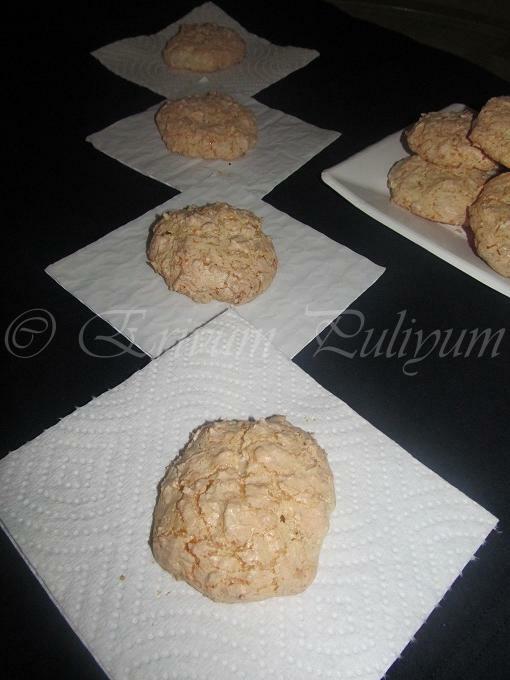 -Place it in the oven and bake for 20 minutes. 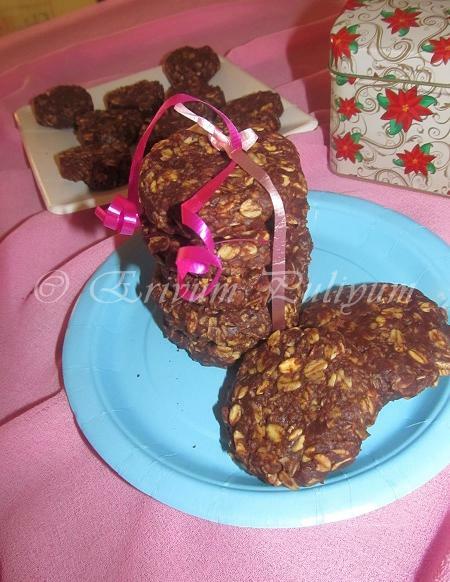 -Cool on wire rack and cookies are ready to serve!! 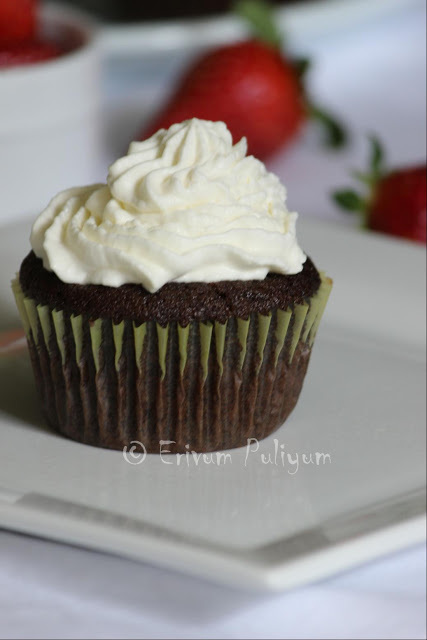 * You can add 1/4 cup all purpose flour to make it a bit dense. * The consistency of egg whites should be fluffy till it forms peaks when whisked. 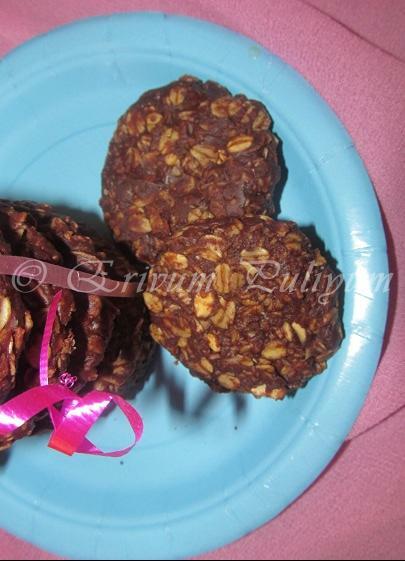 * Nuts can also be added to the ingredients to make it more tastier. 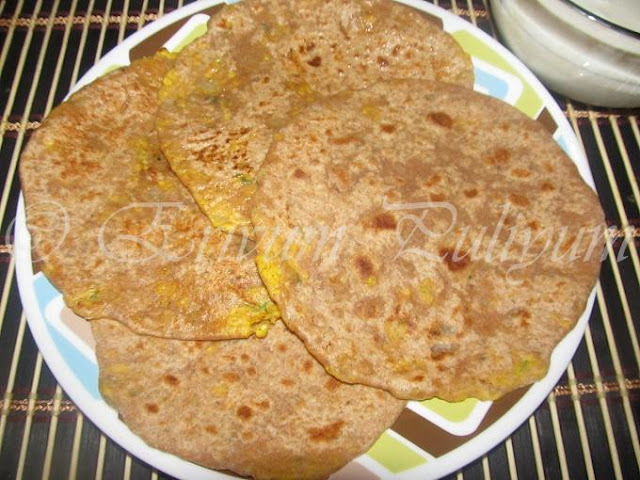 Parathas are the Indian flat breads which are made of wheat flour; mainly originated from the northern parts of India.They can be plain or with different stuffing.Winter is the perfect time according to me to relish parathas the most as they are so tasty when served hot.This time I gave the egg stuffing a try and that was really good.Kids loved this a lot,and I just served it with plain yogurt with black pepper and salt.So,friends enjoy this eggy parathas and hope you all give this a try !! -Take a large bowl and add the ingredients listed under dough to prepare a dough like for chapathis.Cover and leave aside for 10-15minutes. -In the mean time,Prepare the filling- Heat oil in a non stick pan and saute the onion till it becomes translucent. -Add the ginger garlic paste and saute till raw smell disappears. -Add the spices,salt and cilantro. 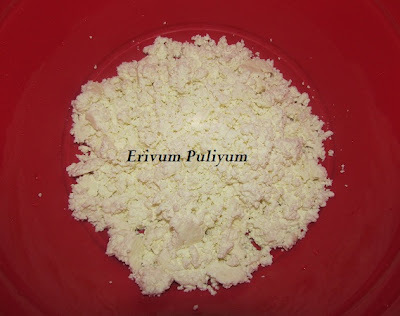 -Make a well in the center of the pan and break eggs one by one into it.Scramble the egg and cook on medium flame.Dry the contents and put off flame.Let it cool. 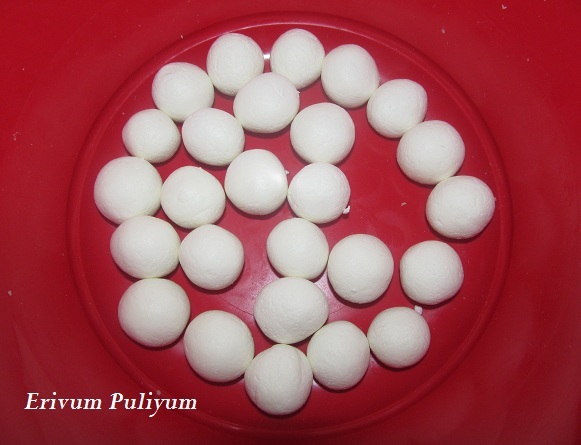 -Now,Take the dough and make 8 balls.Roll one ball and lightly flour the surface and roll it using a rolling pin into 3'' diameter.Take 1.5 tbsp of filling and place it in the center. -Close the chapathi like a pouch or bag and seal tightly. 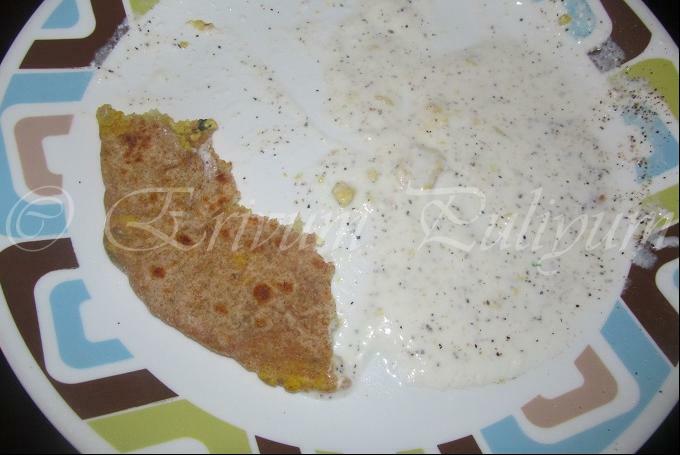 -Heat a tawa / frying pan and place the paratha on the heated tawa. 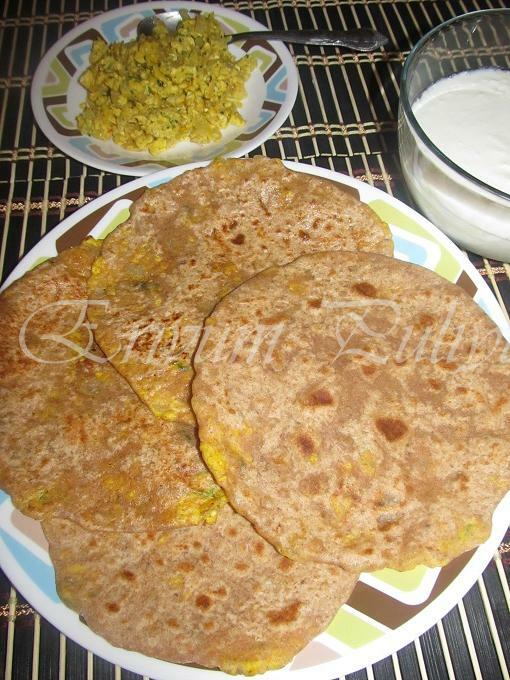 -Cook both sides of the paratha till equally done . 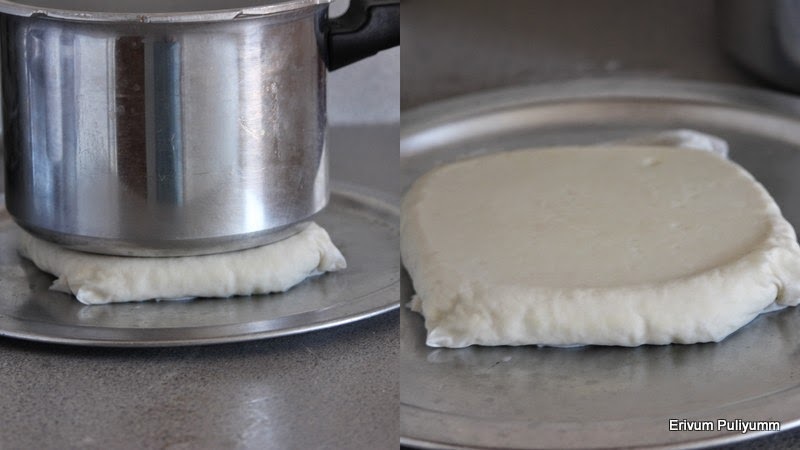 -Now apply some ghee or oil on both sides. -Repeat the same with other balls. 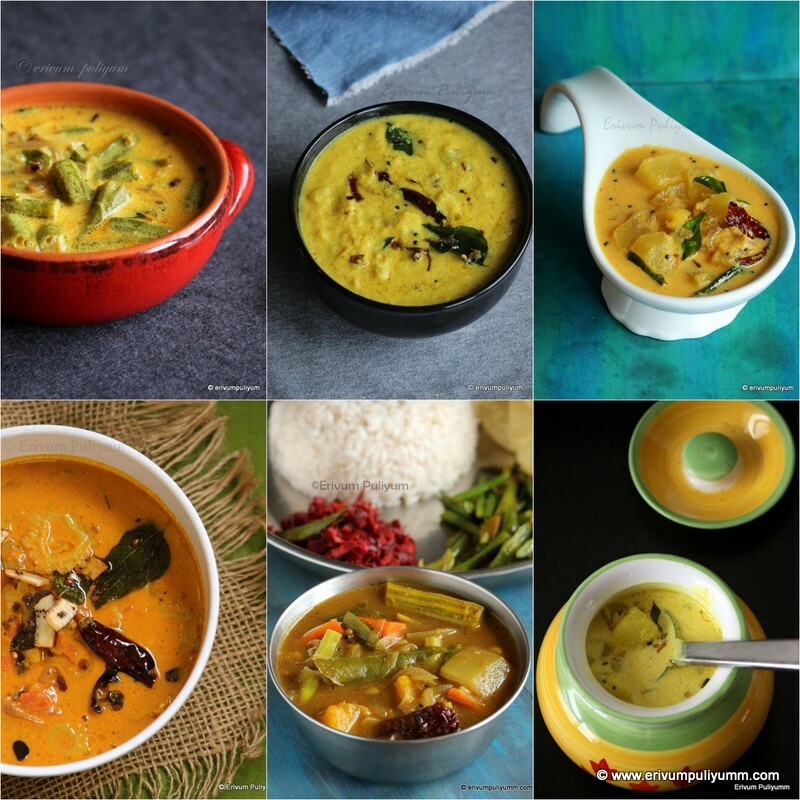 -Serve it hot with raitha of your choice !! 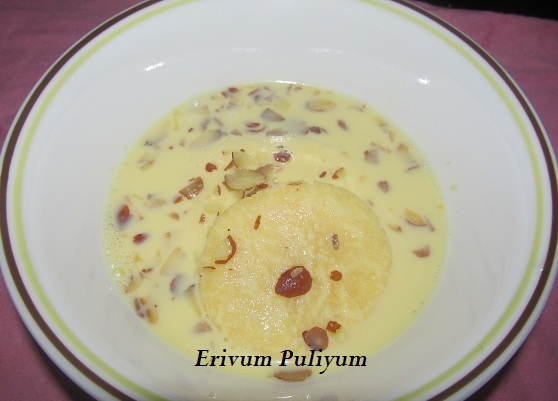 * Adding carom seeds is optional but it gives a nice flavor and helps in digestion too. 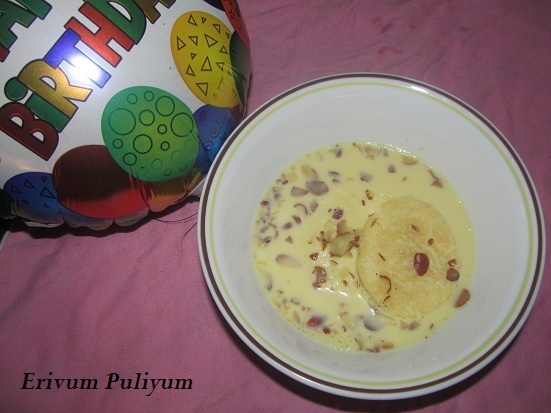 * I served it with plain yogurt mixed with black pepper and salt,tastes good . 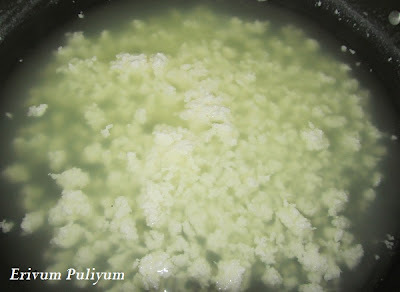 * You can use ghee to apply for kids & oil for adults. Dhokla is a Gujarati snack and is made of chick peas flour(besan).I love dhoklas a lot esp the garnish on top with cilantro,green chillies and shredded coconut tempts the most :) and was my favorite during college days.This is a steamed snack and a very simpler one to prepare.If you love savory snacks,you will love this snack as well.The original recipe is to done with eno fruit salt but I replaced it with baking soda.It came out really good ,soft and fluffy.So,sharing the instant dhokla recipe!! 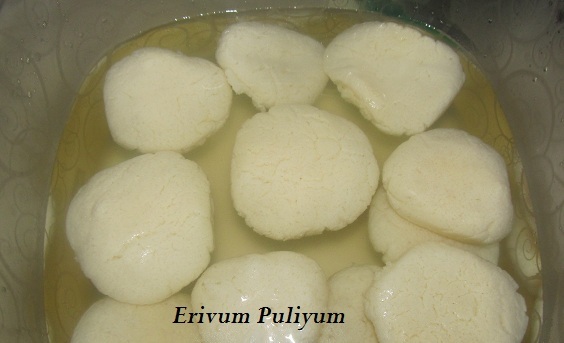 -Place the gram flour in a wide bowl.Add in the salt,sugar,green chillies- ginger paste,turmeric powder,water,curd,lemon juice and mix well without any lumps. 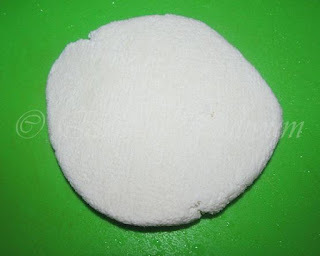 -Grease a plate with oil and place a steamer with water in it on medium heat. -Mix the baking soda at the end just before pouring it into the plate. 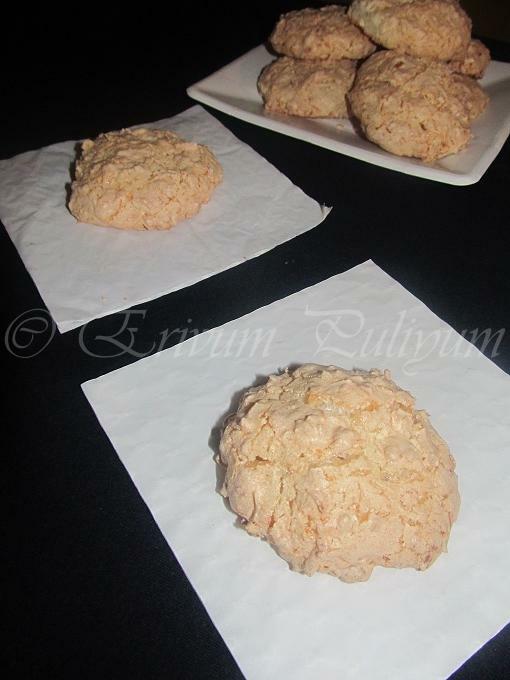 -Pour the mixture into the plate and place it in the steamer . 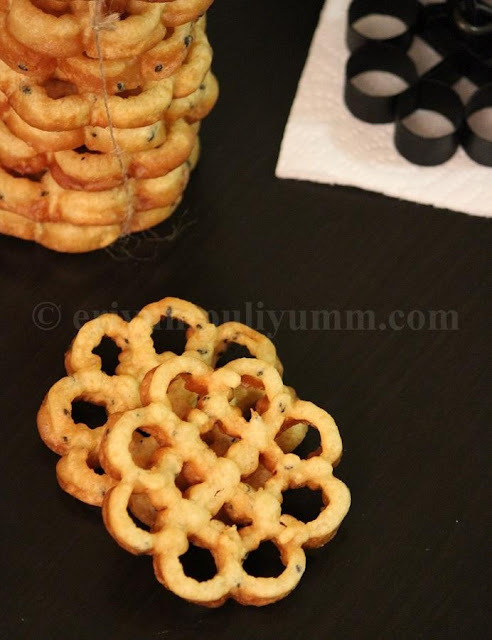 -Cool for few minutes and invert it on a plate .Cut into square pieces. 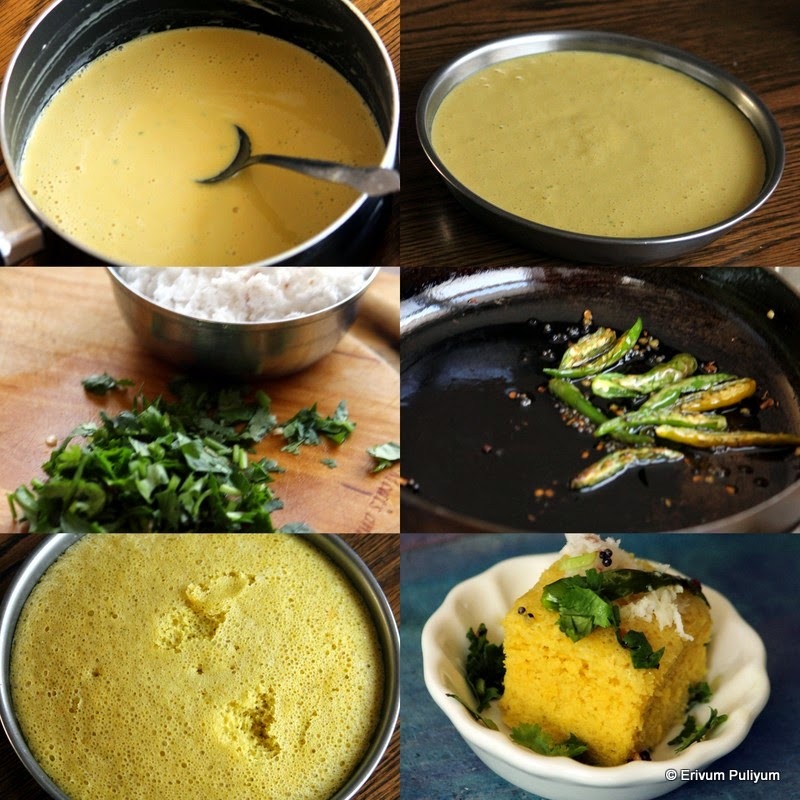 -Heat oil in a pan for tempering,splutter mustard seeds and saute the green chillies.Pour it on the dhoklas. 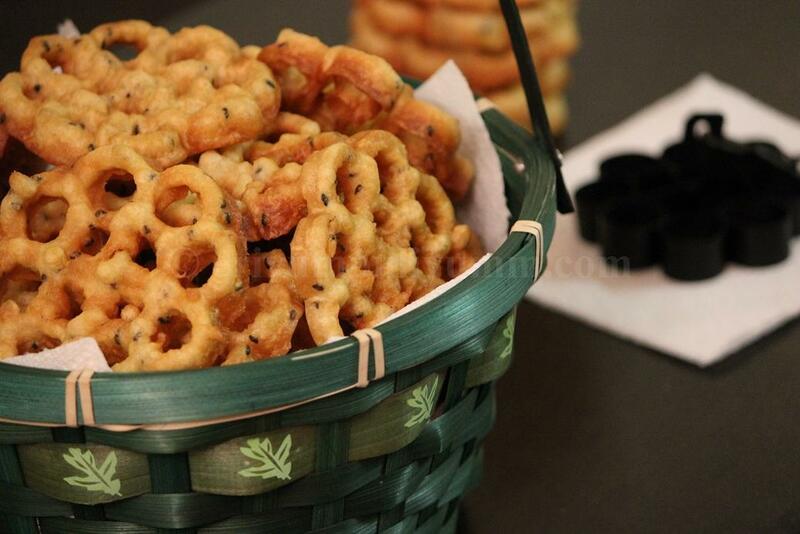 -Garnish each piece with shredded coconut and chopped cilantro !! *I have used baking soda,it came out very spongy. 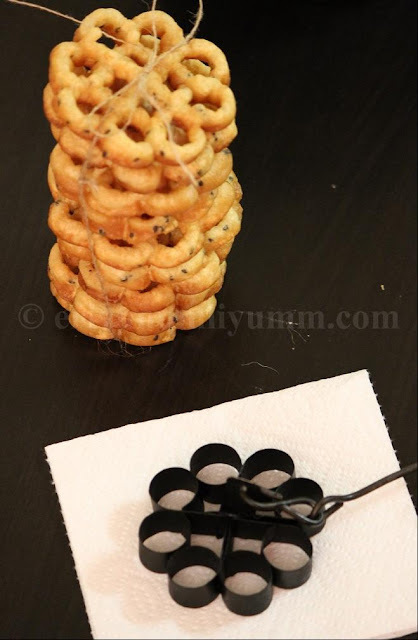 *Use the measured amount of water otherwise it may not come out perfect and go watery. * Use the ginger as it helps in digestion and a nice flavor too. 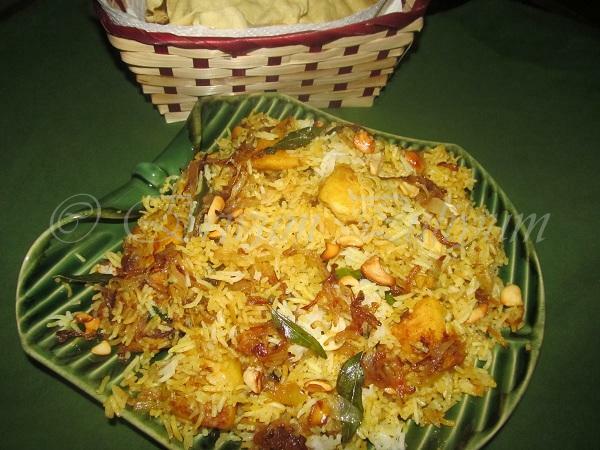 Biriyani is loved by all,it has a lovely flavor lock and it is quite a tedious process,but the end result is worth tasting.Earlier I had tried the Chicken dum Biriyani and now this time for a change I tried this and believe me,My family just loved this biriyani.My kids love fish and so it was much simpler for me.They just devoured it. 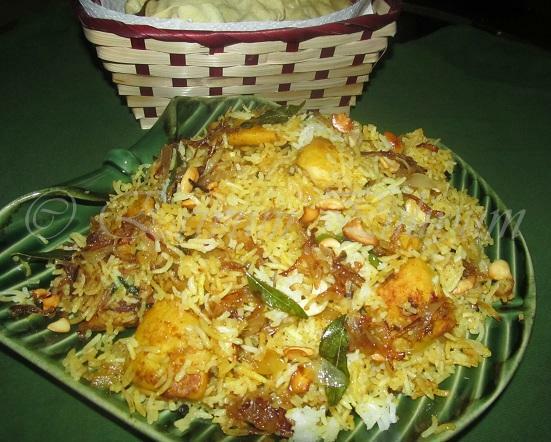 I was happy to see that.I prepared a large amount of biriyani but here in the recipe,I just reduced the ratio to a 1.5 cups rice ratio to make things easier.So friends,Hope you will try this at your home too and will definitely love it! -Wash under running water 5-6 times until all bad odour disappears or else repeat the first step. 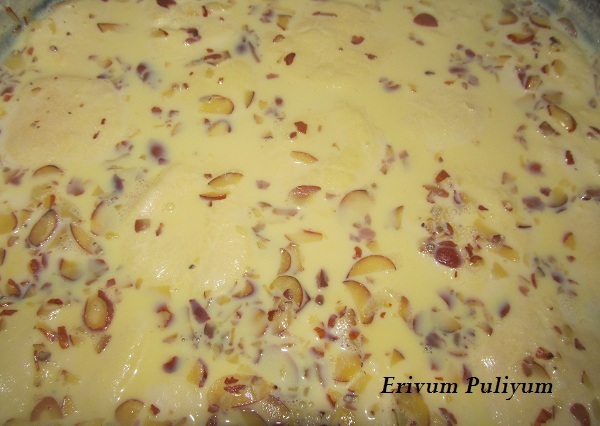 -Cut into medium sized pieces and marinate using the ingredients listed for 1 hour. -Drain on a paper towel and keep aside. 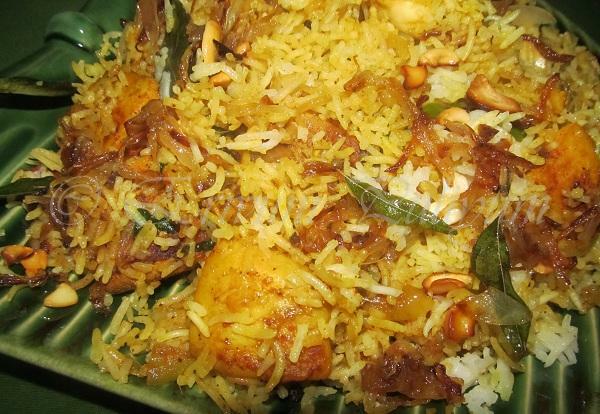 -Place a cooker with 2.5 cups water ,add salt and the other spices listed under cooking rice .Bring to boil and add rice.Keep on medium flame.Cover and cook till the water evaporates and the rice is cooked.Put off flame. 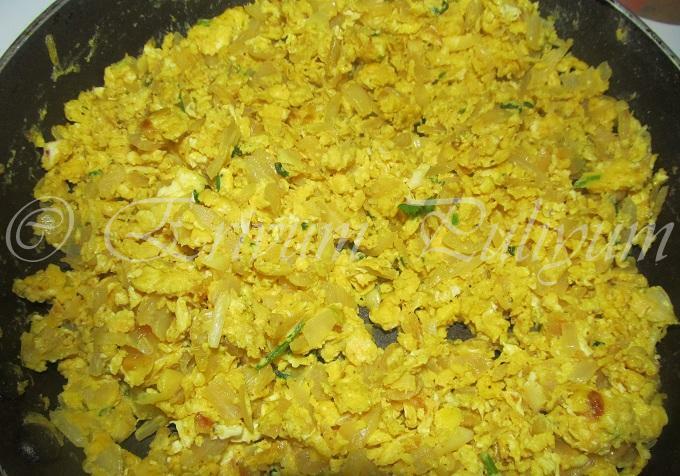 -Add all spices listed to prepare masala and saute for 2 minutes till the raw smell vanishes. -Cover and cook for 10 minutes till gravy thickens.Keep this in low -medium flame.Add the cooked rice on top.Cover or seal it tightly and leave for another 15-20 minutes. 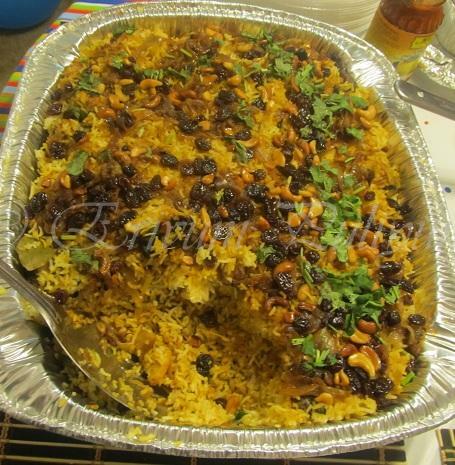 -Heat another pan with 3tsp of oil and saute the onion for garnish till brown and add to the cooked rice along with fried cashews ,raisins and chopped cilantro . *You can skip the caramelising fishes if you have salmon or king fish .I had used tilapia and these fillets can break easily,so had fried them. 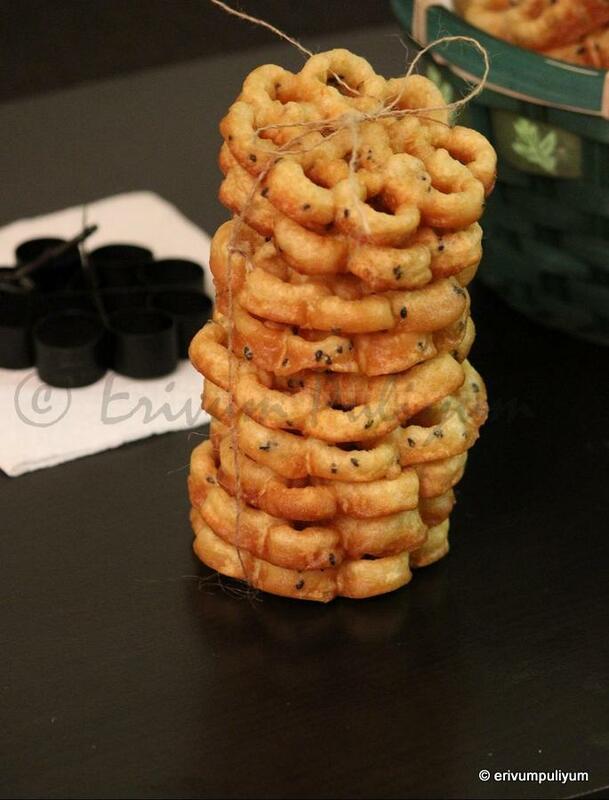 *You can also skip the fried onions for garnish too.